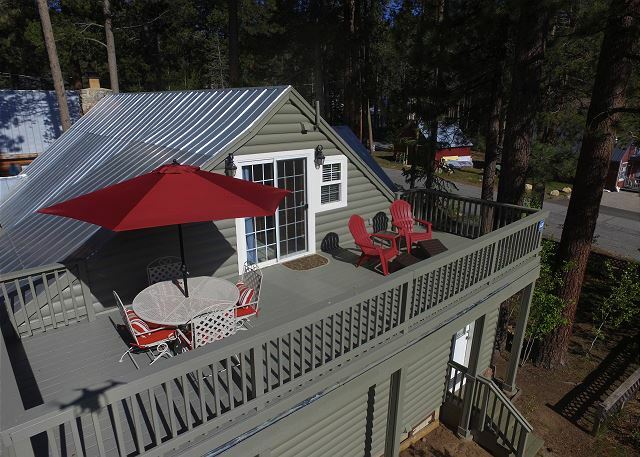 You won’t find a more charming or comfortable cabin in town. 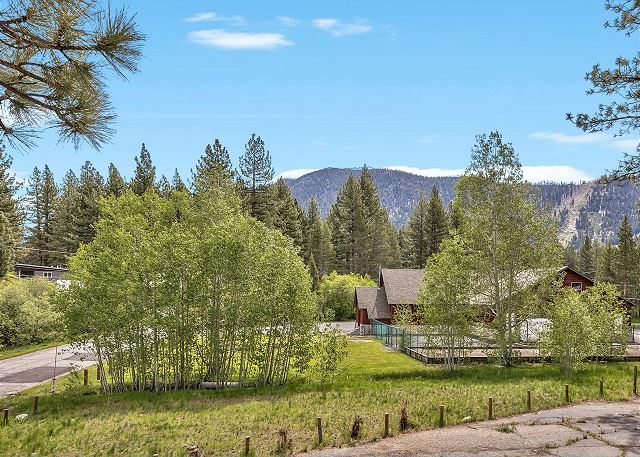 Located in a peaceful neighborhood, across from a grassy meadow, with an unobstructed view of Gun Barrel ski run on Heavenly Mountain. Perfect for 2 families with kids; downstairs living with kitchen, living room and 2 bedrooms on the first floor, and the perfect kids loft upstairs with TV and foosball table, 3 comfy beds and bathrooms. Both downstairs bedrooms open to private deck with hot tub, BBQ and dining, while upstairs balcony with sliding door is perfect for enjoying the magnificent view. Enjoy the added luxury of a updated gourmet kitchen with all new stainless steel appliances, open kitchen, dining area and comfortable living room and charm from the outside in. 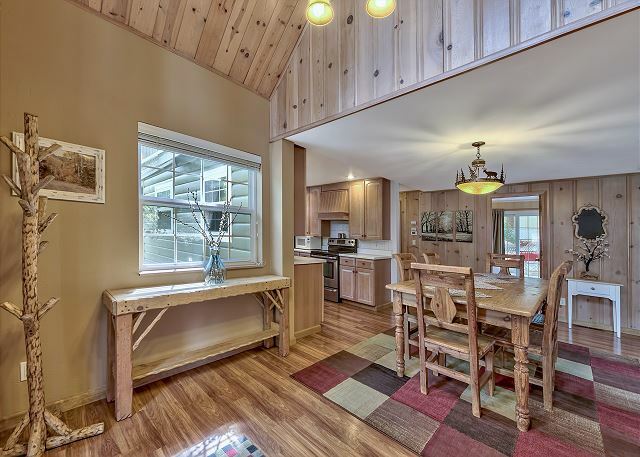 With enough sleeping and dining space for 8 people, this house is perfect for groups who want to fill their days with activities. 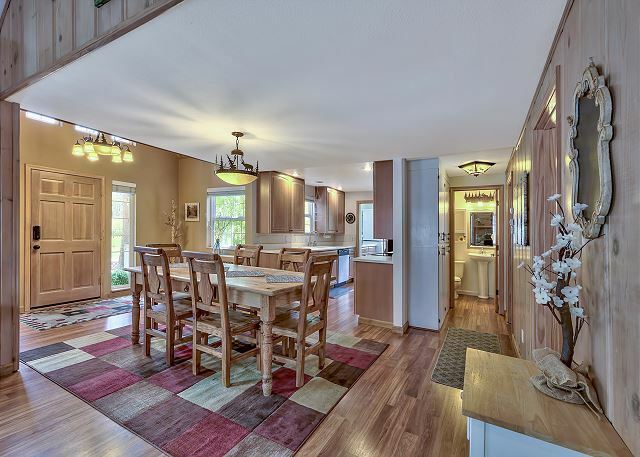 This house also caters to people who enjoy a well stocked kitchen to cook meals. The loft is an added bonus for groups with children. (Please note: 8 individuals can never be exceeded at any time in this home). 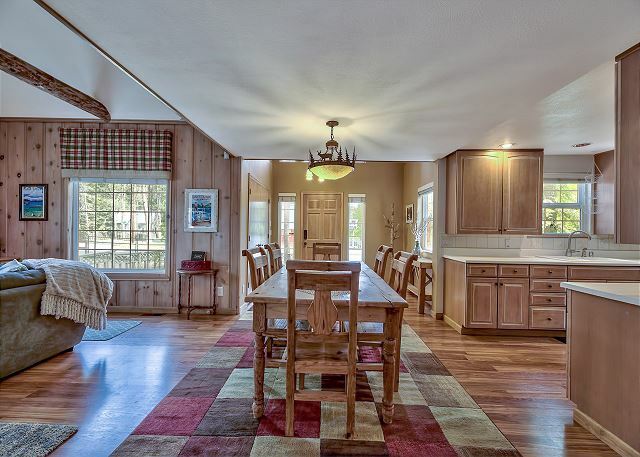 As you enter the front door, you’ll immediately see the dining area with seating for the whole family. Need to rest before unpacking the car from the day’s events? 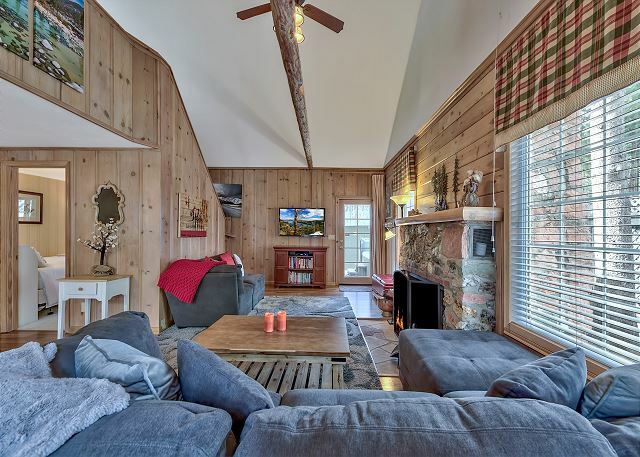 Turn on the large high-definition TV, start a fire in the wood-burning fireplace, and put your feet up on one of two couches as you comfortably fall into the relaxing environment the living room exhibits. 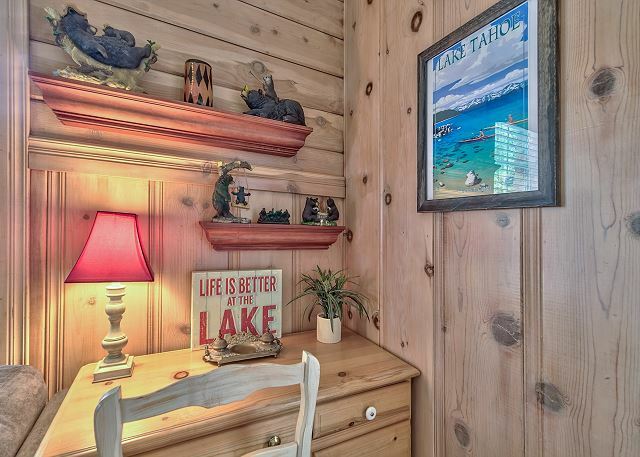 There is also a desk should you need to catch up on any work while on your vacation. 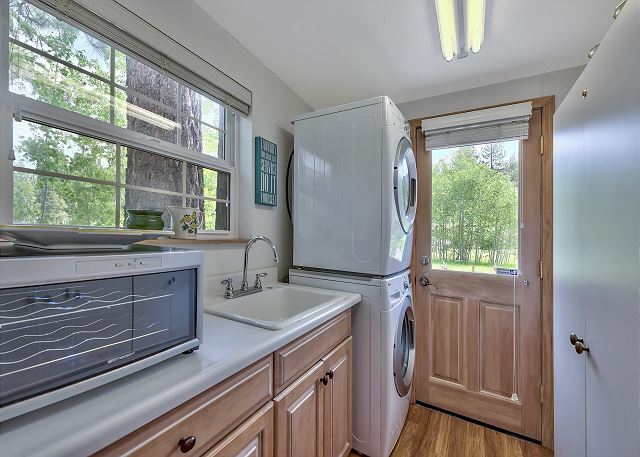 A fully stocked and updated kitchen is just a few feet from the dining area and the laundry room extends from the kitchen. The master bedroom with an enclosed full bath will make you feel like royalty as you lie on the California King bed. Bordering the master bedroom is a half-bath and down the hallway is the second bedroom complete with a queen bed. Each of these rooms, as well as the living room, have a door that leads outside where you can soak up the sun, throw snowballs, grill something on the BBQ or kick back in the hot tub. Want to steal away from the rest of the crowd and improve your foosball skills? 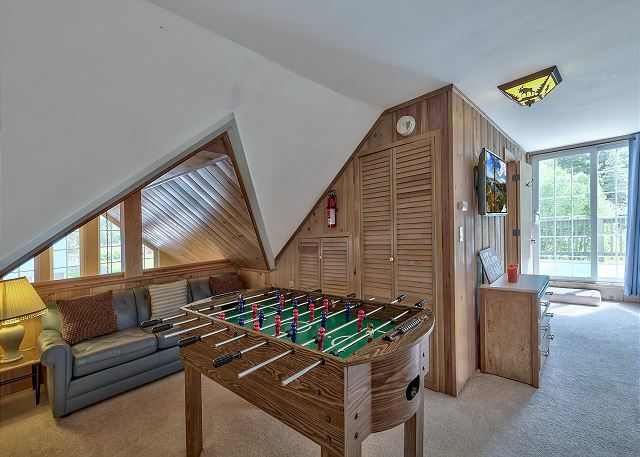 Head up to the loft where a foosball table, leather couch, and three beds (queen and two fulls) await. A full bath is also available in the loft for easy access to those residing upstairs. 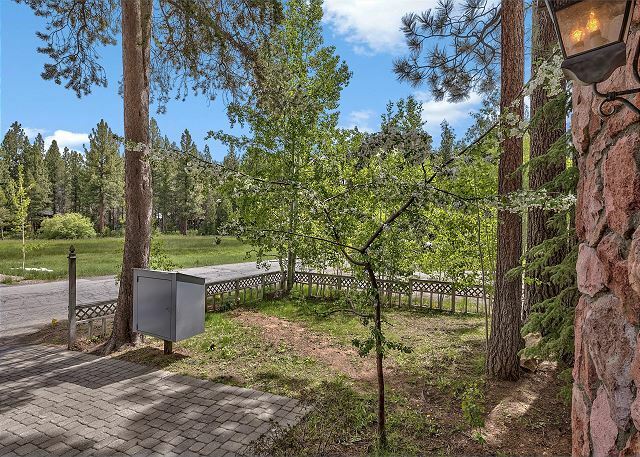 Step outside on the balcony to lounge on the patio furniture and fall in love with the Heavenly views, or plan what activities you want to do in the wide open space right next to the home. This home has security cameras on the driveway to ensure parking does not exceed legal requirements. We care about your safety and security. We do not permit any video security devices inside our homes. 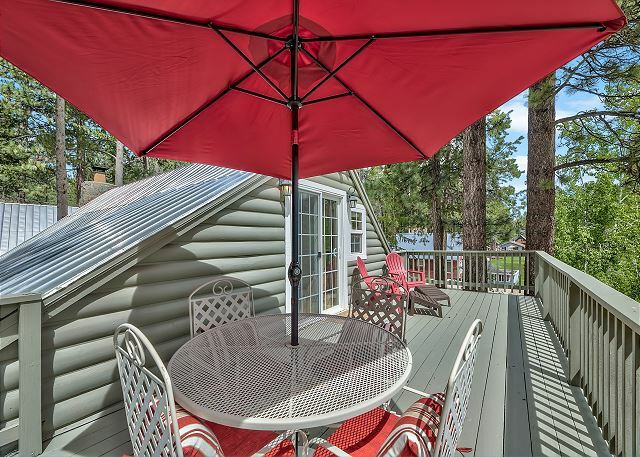 This is a very clean well-kept house in a cabin-y residential area of South Lake Tahoe, within five minutes of Heavenly. There are two bedrooms downstairs with a full bathroom and a small bathroom and three beds side by side in the loft upstairs. This is a very nice house and we'll stay again. 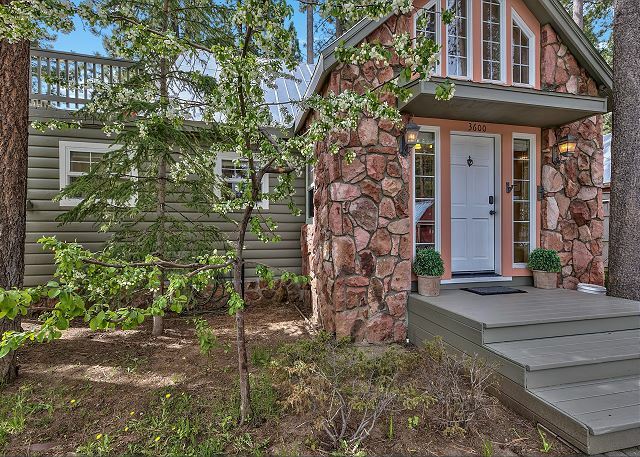 We absolutely loved our time at this charming Tahoe home. The kids enjoyed the loft with all the extra amenities to make them feel like they had their own little area. The adults enjoyed the hot tub, and the kitchen was very well stocked with any cooking item you may need. This location is very close the the California lodge for heavenly and just a short drive to the village at heavenly. We loved our long weeekend. This place was perfect. Super clean, close to town, best view of the south side of the mountain from a residential standpoint. Hot tub was a great touch as well. We will be coming back here no doubt. Perfect property for 2 families. 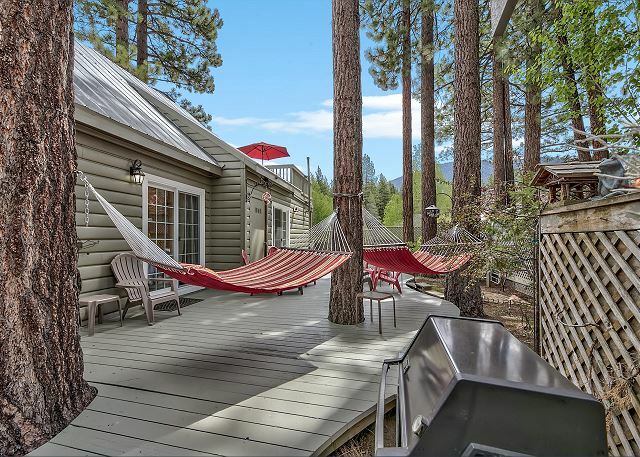 We absolutely loved our time at this charming Tahoe home. The kids enjoyed the loft with all the extra amenities to make them feel like they had their own little area. The adults enjoyed the hot tub, and the kitchen was very well stocked with any cooking item you may need. This location is very close the the California lodge for heavenly and just a short drive to the village at heavenly. We loved our long weeeknd. Beautiful home, great location. The host was very accommodating. Would definitely stay there again. We pulled up to the cabin and we all did a collective "Yay"! The cabin is so cute inside and out. The lights were on and classical music was softly playing in the background. We could not have asked for a better welcome! 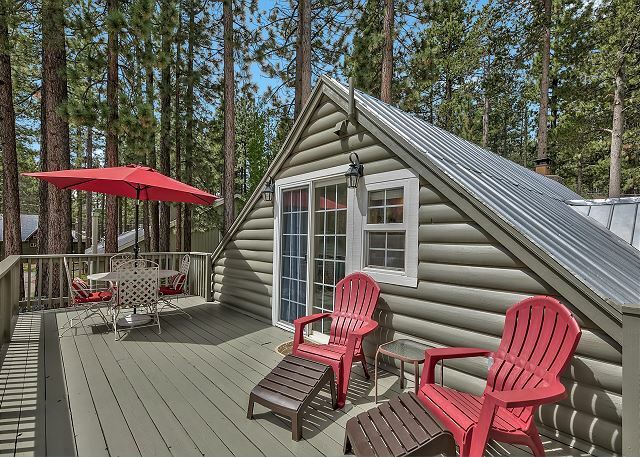 The cabin was perfect for our two families to enjoy South Lake Tahoe. The cabin was clean, well appointed and was even prettier in person. I highly recommend not only this particular cabin but the rental company who did an amazing job. We are a family of 6 and stayed for 1 week. The check in experience was easy and flawless and the information provided for the property was detailed with simple instructions on how things worked. The house had everything we needed to cook and wash clothes etc. very well appointed. The beds were comfortable and hot water in abundance too...that’s always important. We skied Heavenly, Kirkwood and Northstar and found the home to be very central for us, but we did have a car. Thank you for having us and we would recommend your property to friends for sure. Beautiful property in great location. Close to everything. Clean, comfortably furnished, clear instructions posted. All of the beds were super comfy and I was so impressed with all the cookware and gadgets provided. Great quality stuff to help make delicious meals. They thought of everything. The place is very nice just like other reviewers said before me. We had a great time and found nothing about the place we didn't like. In fact everyone was raving about the beds in both bedrooms and the loft. Most times when staying away from home, coming back to my bed is a pleasure. Not so much here, the mattresses were actually nicer than my one at home.